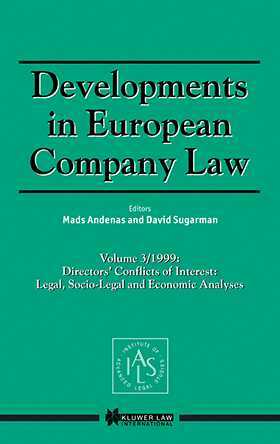 The essays in this third volume of Developments in European Company Law are concerned with conflicts of interest and duty in company law. A first part provides a legal analysis of the duties of company directors, of their accountability, and of the trustee's perspective. A second part provides a socio-legal analysis and a third part an economic analysis. The essays provide important contributions to law reform and scholarly debate of these pressing issues of company law. The contributors include leading judges with an interest in the field, Lord Hoffmann and Lady Justice Arden, and academics from the UK and Australia, Charles Harpum, John Birds, John Lowry, Rod Edmunds, Paddy Ireland, Ian M. Ramsay, Geof Stapledon, Neil Andrews, Janet Dine, Christopher Riley, Andrew Griffith, A.J. Boyle, Simon Deakin and Alan Hughes.